The London Independent has a story today about 85-year-old musician and Holocaust survivor Esther Bejarano, who is collaborating with a multiethnic hip-hop band with an anti-racist message. Their first album, Per La Vita, was released last year, and a documentary about the band is being shown in German schools. Esther Bejarano says music helped to keep her alive as a Jewish prisoner in Auschwitz. Now, 65 years after the liberation of the Nazi death camp, she has teamed up with a German hip-hop band to get her anti-racism message to today’s youth. The daughter of a Jewish cantor from Saarbrücken in western Germany, Ms Bejarano studied piano at home until the Nazis came to power and tore her family apart. She was deported to Auschwitz, where she became a member of the girls’ orchestra, playing the accordian every time trains full of Jews from across Europe arrived at the death camp. “We played with tears in our eyes,” Ms Bejarano remembered. “The new arrivals came in waving and applauding us, but we knew they would be taken directly to the gas chambers.” Although she survived, her parents and sister, Ruth, were killed. 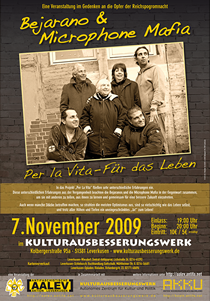 For 20 years, Ms Bejarano has played music from the past – Yiddish melodies, tunes from the ghetto and Jewish resistance songs – with her children Edna and Yoram in a Hamburg-based band called Coincidence. About two years ago, Kutlu Yurtseven, a Turkish rapper from Microphone Mafia, asked her about a collaboration to combat the growing racism and anti-Semitism in Germany. The octogenarian thought hip-hop “was really a bit too loud” but saw it as a way to reach Germany’s youth. Will the U.S. Send Haitian Refugees to Guantanamo? The U.S. prison complex at Guantanamo Bay, Cuba, is inextricably linked to terrorism and torture in the minds of most Americans today. But not very long ago, it was known for torment of a different kind. In the 1990s, an immigrant detention center at Guantanamo served as a holding pen for undocumented migrants from the Caribbean who were caught trying to enter the United States. Most notoriously, it was a destination for Haitian “boat people,” including some with HIV, who fled their country in large numbers in the wake of the 1991 coup. Haitian detainees at Guantanamo Bay in the early 1990s. Photo: Ivan Curra on Flickr. Now, in the aftermath of the Haitian earthquake, there are signs that Guantanamo may be returned to this chapter in its ignominious history. While the Obama administration suspended deportations to Haiti and granted temporary protected status to undocumented Haitians currently living in the United States, this policy offers no protection to quake victims who try to reach U.S. shores. If large numbers of desperate Haitians begin to attempt the treacherous trip, they could well end up in Guantanamo’s Migrant Operations Center (MOC), operated by the Department of Homeland Security. Last Friday, Fox News was already reporting that Guantanamo was one of the “options on the table” for dealing with fleeing Haitians. One official acknowledged that the center likely would become the most viable option “if there was a mass migration” of Haitians from their country…. Once at the Guantanamo facility, the refugees would be supervised by the Bureau of Immigration and Customs Enforcement, which oversees the facility and has contracted the Florida-based Geo Group firm to manage day-to-day operations…. On Monday, Tom Barry of the Americas Program at the Center for International Policy reported on the MOC—which, like an increasing number of U.S. prisons, is run by a private, for-profit company. Today, under a contract with DHS it is operated by Geo Group, a private prison corporation that relies on federal government detention/prison contracts for about 40% of its revenues. In 2003, with the creation of the Department of Homeland Security, MOC was upgraded and its operation transferred from the department’s own Immigration and Customs Enforcement to GEO Group, the country’s second largest private prison firm. In part because of the special international standing of the Guantanamo Bay military base, which one official called “the legal equivalent to outer space,” the State Department is cosponsor of the MOC contract. GEO is the company that also runs the largest privately run detention center–and also probably its worst–in Pecos, Texas. As Tom Barry reported last year, the Reeves County Detention Complex has been the site of two recent riots, several suicides, and numerous deaths from inadequate health care. Is this what awaits refugees from the Haitian earthquake? We sometimes forget that during the Clinton presidency, the United States ran an extralegal detention camp on Guantanamo—and went to federal court to defend its right to do so. The camp during the Clinton years was by no means the nightmarish operation it is now; certainly, there weren’t allegations of torture. But Guantanamo under Clinton produced its own share of suffering and abuses—and perhaps most important for today, the court decision that shut it down was eventually wiped off the books, thanks to legal maneuvers by the Clinton Justice Department. So unless the current administration reverses policy once again, any Haitians who might be taken to Guantanamo could be there for a while. This surely was not what Obama had in mind when he made his campaign promise to close the notorious prison camp.